Comes to the process as a witness. 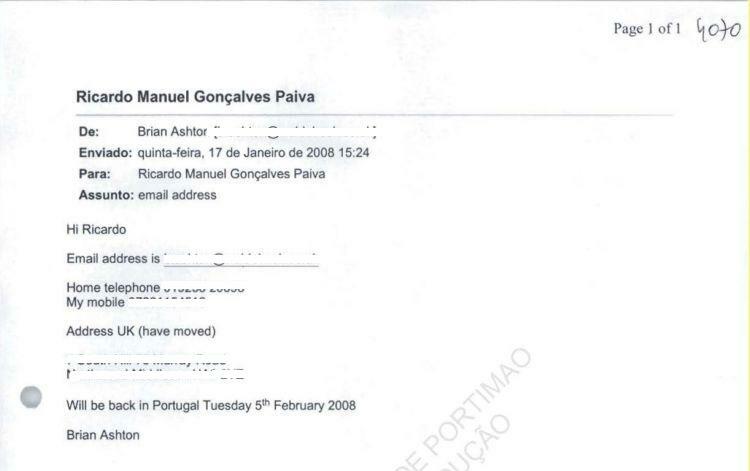 Being of British nationality, she does not understand Portuguese in its written or oral form and is accompanied by an Interpreter. 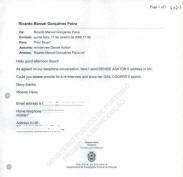 She clarifies that on the 3rd of May 2007, at around 17H00/17H15, when she was in her PdL residence, and whilst her husband sleeping, she heard someone ring the doorbell. She immediately headed to the door, opened it and saw two individuals (one standing behind the other as in a queue). She also noticed that one of them had a folder, with a rigid top, that, she presumes, was a type of identification? or an access card. She did not see what it said. 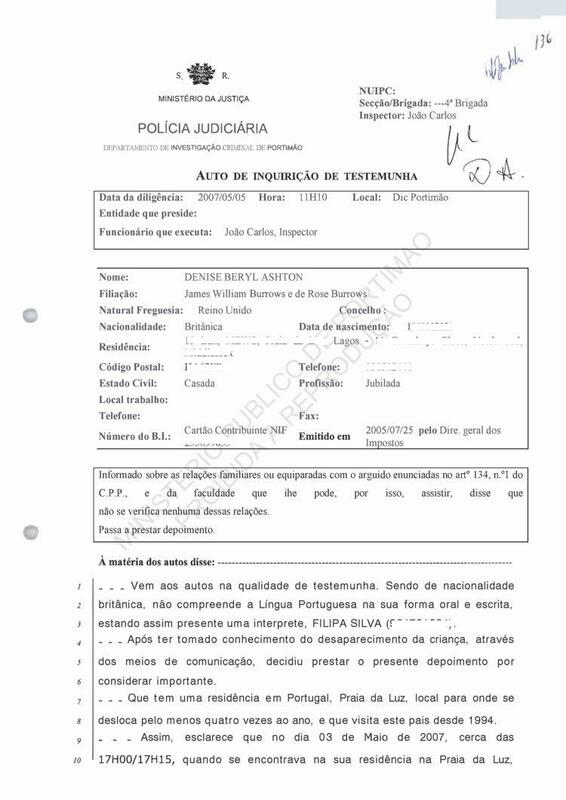 The man in front said a few words in Portuguese to which the witness responded that she did not understand. That same person began speaking in English, not fluently, nor very correctly, and she presumed he was not a British citizen. Now speaking in English, without offering his name, he told her that each year he was authorised to collect donations on behalf of an orphanage. At the same time, he handed her a brochure, on printed paper, which he later took back, as we will see later. 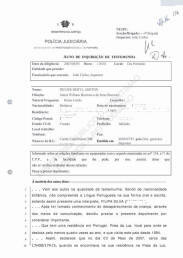 Upon explaining that he asking on behalf of an orphanage, the individual asked the witness if she knew where Espiche was. She assumed that the orphanage was in this location. Immediately afterwards, the individual asked his colleague for a photograph album, with a blue cover, which was exhibited to the witness, and which contained photographs of children. Since she did not have her glasses on however, she cannot be sure about this. He explained then that he could provide her with a receipt, and showed her a book, and alleged that he had been in her neighbours house. That was not true as she knew no one was home next door. Not being interested in making a donation, she immediately told them she already gave to another charity. At this moment, the individual took the brochure from her hand, in a calm manner, and at the same time the witness shut the door and the men left. And nothing more was said. Reads, ratifies and signs together with the interpreter. 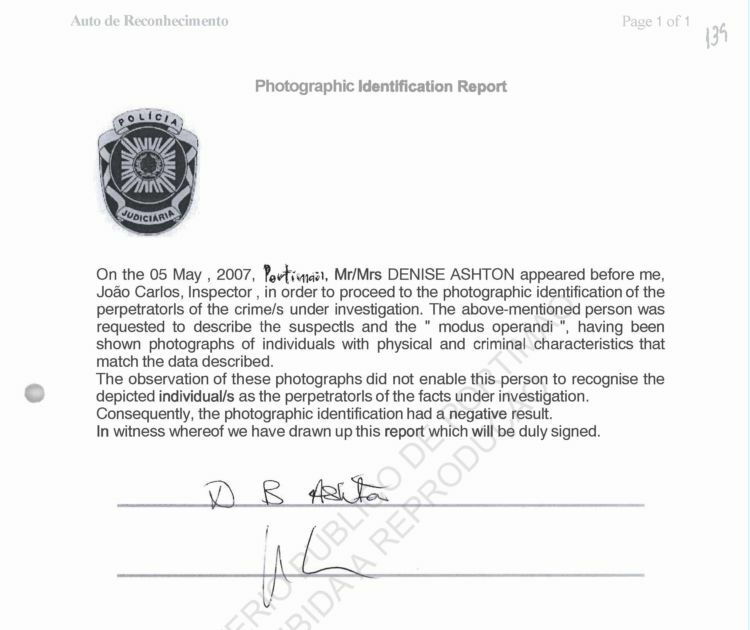 On the 05th May , 2007, Portim?, Mrs DENISE ASHTON appeared before me, Joao Carlos, Inspector, in order to proceed to the photographic identification of the perpetrators of the crime/s under investigation. 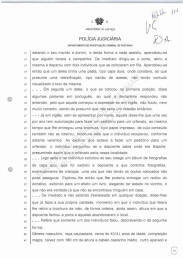 The above-mentioned person was requested to describe the suspects and the " modus operandi ", having been shown photographs of individuals with physical and criminal characteristics that match the data described. The observation of these photographs did not enable this person to recognise the depicted individual/s as the perpetrators of the facts under investigation. 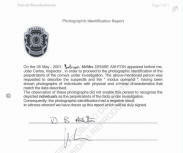 Consequently, the photographic identification had a negative result. In witness whereof we have drawn up this report which will be duly signed. 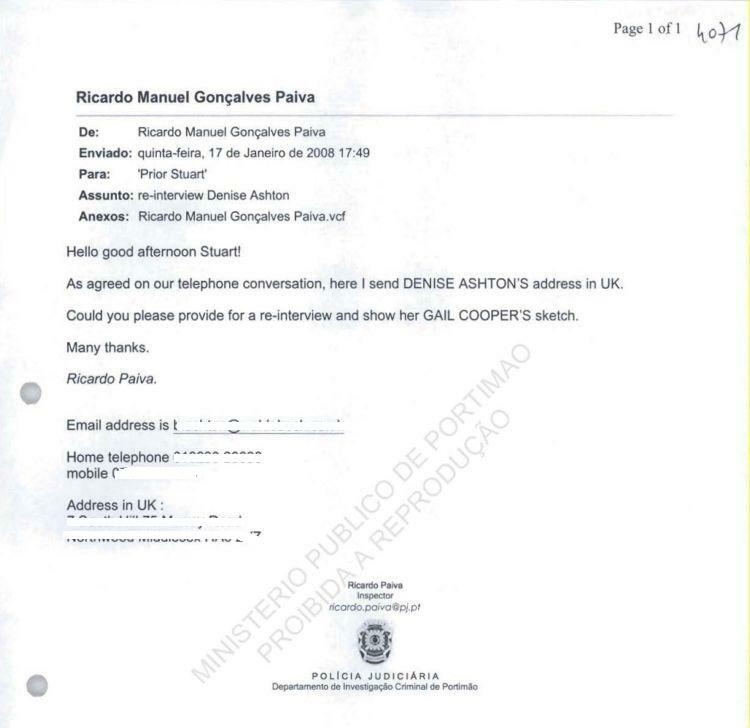 As agreed on our telephone conversation, here I send Denise Ahston’s address in UK. Could you please provide for a re-interview and show her Gail Cooper’s sketch.